There are ten TRAVELER’S notebook diary refills in my hand. Nine of them have the remains of being used, and the last one is completely new. TRAVELER’S notebook was born in 2006, and the first diary appeared in fall of 2007. Those who’ve used the diary since 2007 will be having their tenth diary in their hand. I am looking at the past diaries that leave my mark, and are imaging what kind of stories the tenth one will create. There is a feeling that tenth diary, or the year 2016 will leave records of all the good things and exciting events that will come up. * These are of limited availability. In case they are sold out or out of stock, we would appreciate your understanding. The Plastic Sheet and Customized Sticker Set which carry designs available for 2016 only are created in collaboration with Pan Am. A plastic sheet for writing comes handy in many traveling situations – when you write in your diary while standing, need a bookmark so you can open up the pages you want immediately, measure the length of an object, draw a straight line, and many more. The 2016 version was created in collaboration with Pan Am, once the national flag carrier of the USA. 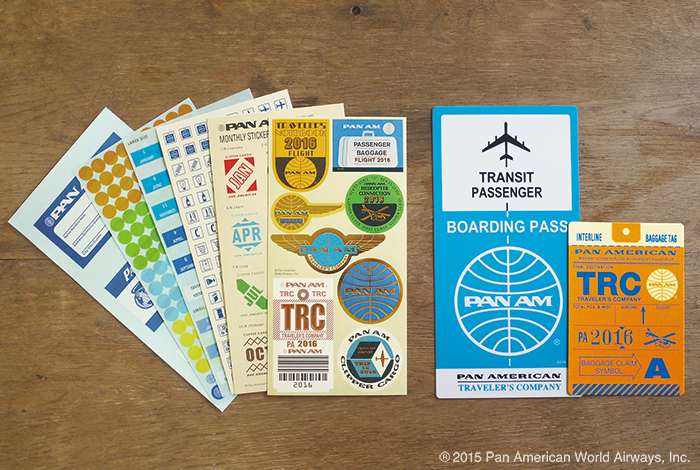 Customized Sticker Set include, in addition to an index, schedule, and transparent spherical stickers, those to customize the front cover of your diary after Pan Am’s crew badge and baggage tags, as well as a pocket sticker whose motif is the baggage label. 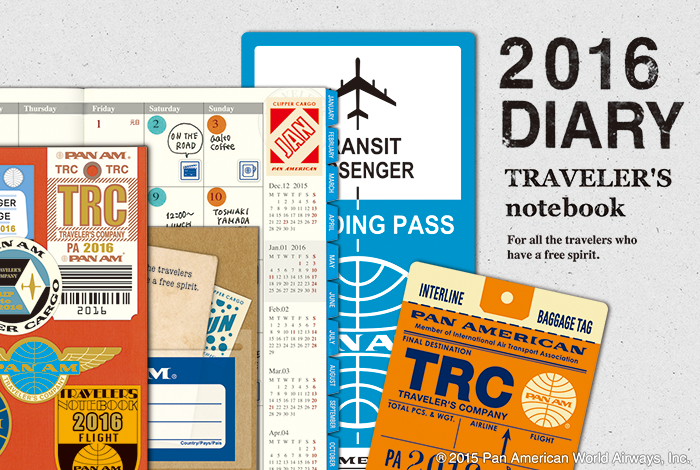 You can “fly through” 2016 with your diary customized after Pan Am designs. The Plastic Sheet is helpful when you write while you are standing, and can also be used as a bookmark and a ruler. The 2016 version was created in collaboration with Pan Am. Its back side has a grid printed on it, which serves as rules to help writing on blank paper. 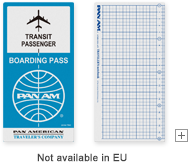 Customized Sticker Set for 2016 Diary include, in addition to an index, schedule, and transparent spherical stickers, those to customize the front cover of your diary after Pan Am’s crew badge and baggage tags, as well as a pocket sticker whose motif is the baggage label. You can add more fun and ease of use to your TRAVELER’S notebook Diary, which has a very simple design.